Split the Spencer Gulf King Prawns in half and remove the intestinal tract—set aside in refrigerator until ready to marinate. Finely chop all the herbs, ginger, garlic, chilli and lemon zest and mix together with the olive oil, salt and pepper. Smear the marinade on the cut side of the Spencer Gulf King Prawns and place on a baking tray, marinade side up. 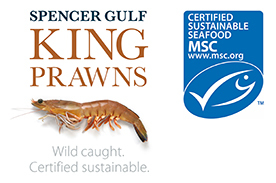 At this point, you can either cook them in a pre-heated 250C oven for about 5 minutes or on a preheated barbeque or charcoal kettle barbeque—cook by pressing the Spencer Gulf King Prawns down to caramelise the flesh. Season with a squeeze of lemon juice, salt and pepper and serve with a lemon wedge, extra virgin olive oil and parsley.